New Winter 2018: Grandmothers love lockets and pictures of their grandkids and other special people! 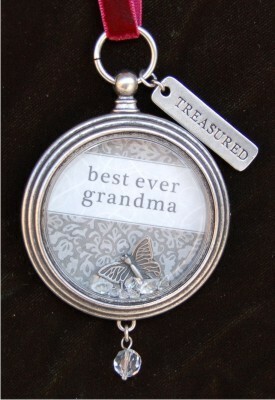 The best ever grandma keepsake locket frame Christmas ornament combines two loves into one, so add a picture of the grandchildren and surprise a wonderful lady during the holidays, on her birthday or just because. These frame ornaments personalized with a picture are made from quality pewter and glass. The Treasured tag is attached along with a plush ribbon. A graceful butterfly and crystals complete the design in beautiful fashion. Show your love and admiration with a gift she'll cherish always, the treasured keepsake locket Christmas ornament that can be displayed with pleasure anywhere.